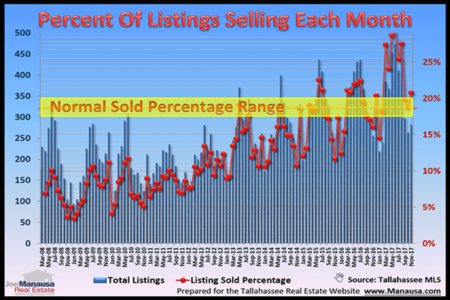 Having just updated our monthly report of real estate supply and demand in Tallahassee, I am concerned about the rate at which the number of homes on the market is growing in relation to the current number of buyers in the market. This report will take a closer look at how many homes are on the market in each price range, as well as the number of home sales that have been recorded by area and price range over the past year. The following real estate graph shows the number of homes for sale in Tallahassee by price range (red) as well as the number of homes that sold over the past year (green), with the units recorded on the left vertical axis. The blue line shows the relative supply of homes (recorded in months of supply on the right vertical axis). The relative supply of homes for sale dropped slightly from June 2013 to June 2014, but not enough to put a dent in the glut of homes on the market. In the graph above, we have shaded the area yellow for which the market would be in balance for both buyers and sellers alike (market equilibrium), thus when the blue line is above that area, it is still a seller's market. 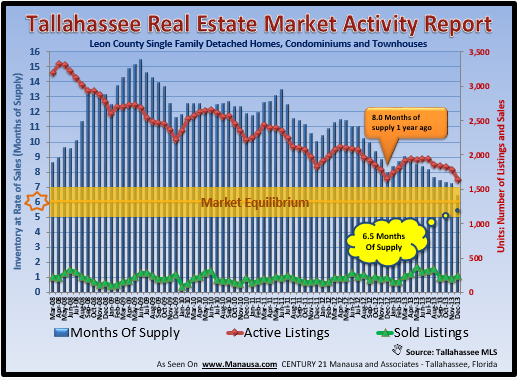 Currently, there are very few homes in market equilibrium in Tallahassee, and buyers are sitting very pretty right now. 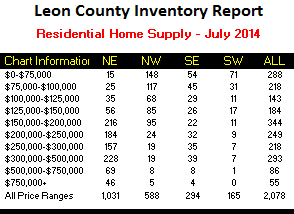 The table on the right shows the number of homes for sale in each area and price range. It is important to understand how much competition is out there, whether you are buying or selling. Too often, sellers set an asking price without even considering how many similar homes are available for the buyers that are in the market. 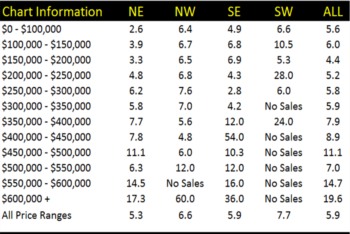 The table on the left shows the number of homes that sold over the past year for each area and price range. 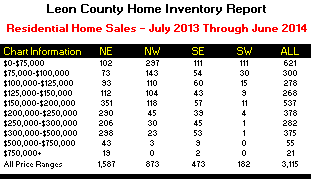 It is important to understand how much buyer activity is out there, whether your are selling or buying. Too often, we see buyers want to make a low-ball offer without even considering how many other buyers might be making an offer on the very same home. Whether you are buying or selling, you can gain an advantage by knowing the breadth and scope of your competition. The key to buying a home below market is the same as it is for selling a home above market. You have to know your position in the negotiation, and you have to make a compelling offer. This cannot be done without excellent insight on current market conditions. If you are planning on selling a home or buying a home in Tallahassee, drop me a note and we can schedule a time to help you review real estate supply and demand in Tallahassee for your specific situation and thus help you win in your next real estate transaction.